Another season is ending. March is usually a quiet month for me, not much happening in terms of deer stalking. Cull plan usually is achieved by end of February and most of the time out I spend on foxing. Now is also good time to summarize and reflect on the past season. However, I would not like to go through a list of successes and failures of 2016/17 season, but concentrate on my thoughts about the gear I have been using, clothing to be precise. I have been using Harkila Pro Hunter X suit for the last two seasons. I used it exclusively from September-October until March-April for two consecutive years, which seems to be enough time to find out about the product’s advantages and disadvantages. Pro Hunter series is one of the top lines of Harila clothing. 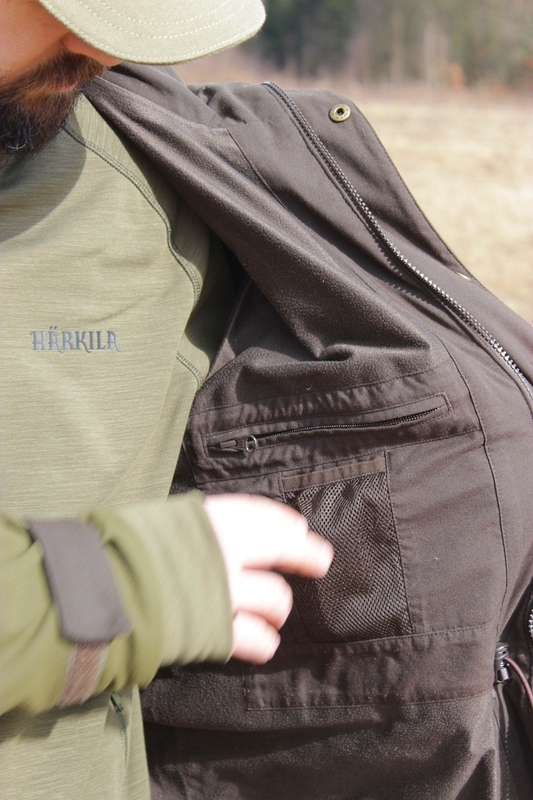 First Pro Hunter jacket Harkila released in 2005, but its predecessor Harkila started making in 1992. Since then several new improved releases happened, but the Pro Hunter line always remained the flagship of Harkila. Pro Hunter X jacket was released in 2013. It is made of extremely hard-wearing Airtex fabric with Cordura reinforcements. It is also Goretex lined making it fully waterproof, but it also is rather silent in comparison to other Goretex jackets I used before. The outer fabric is really tough. My jacket after two years has no damage at all and still looks pretty much as on the first day I got it. The jacket was heavily used on average several times a week during season. I walked through thickets, clear fells, brambles, climbed fences and still jacket has no visible damage. I was sceptical at first about 5-year warranty Harkila provides for the Pro Hunter line, but after 2 years of use I can honestly say, I do not think I will have any problems with this product any time soon and it will hopefully last me a long time. Apart from being hard-wearing Pro Hunter products are comfortable and well thought out. Jacket is warm enough for cold spring mornings and rainy autumn nights, and with good layering I used it throughout winter months with temperatures ranging from +10C to -15C. 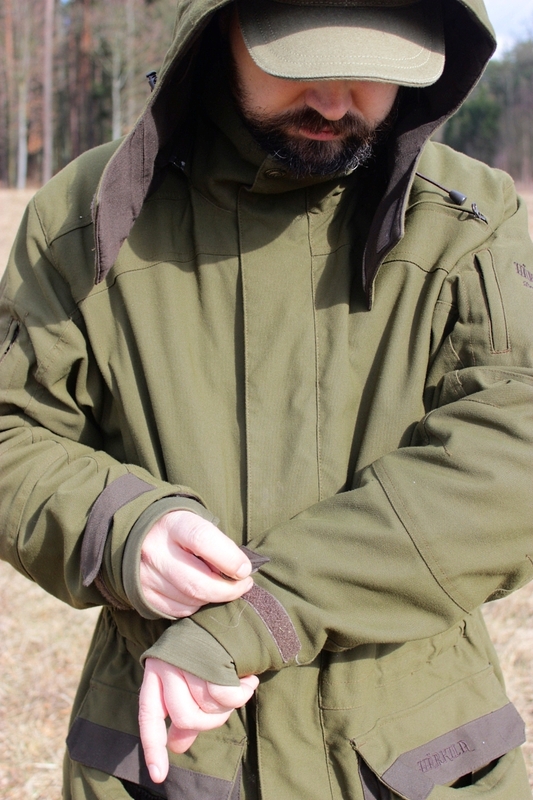 Only during late spring and summer months I found the Pro Hunter too warm, so I swap the jacket for fleece at the end of the season and take Pro Hunter out of the closet at first frosty mornings of the rut. 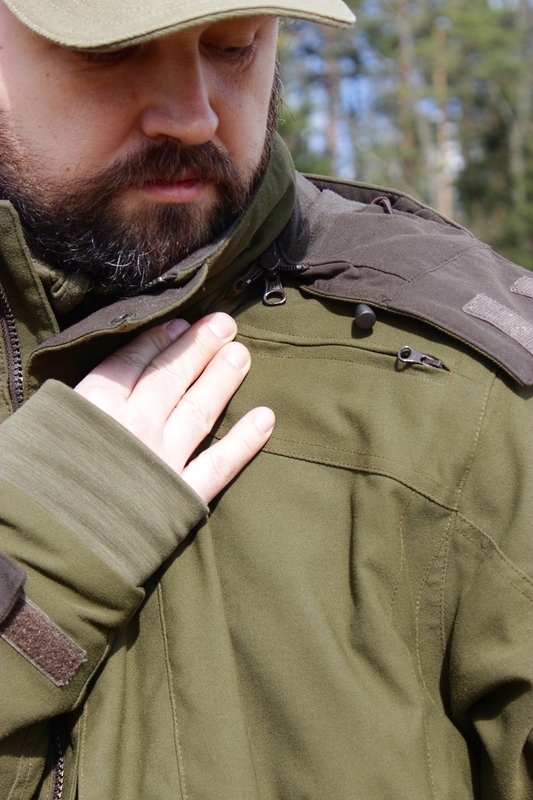 Jacket is wind and waterproof and has very nice detachable hood. This season during a driven hunt I got a seat at the edge of the wood and fields, and spent there 4 hours in a constant rain, but the suit kept me dry and warm. With the hood on, sleeves tied and hands in the hand warmer pockets, it really is warm and comfortable despite rain and snow. 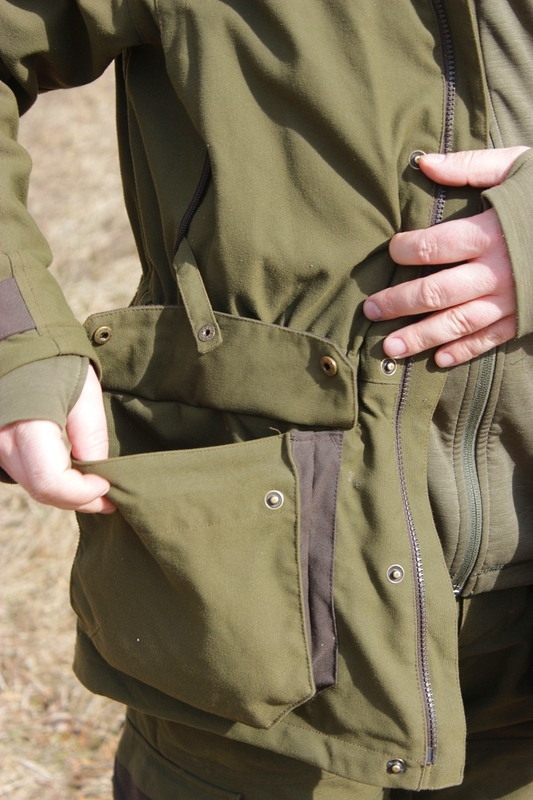 When I already mentioned driven hunts, the jacket features “action back” and does not feel bulky or is not restricting movements or shouldering a shotgun/rifle. 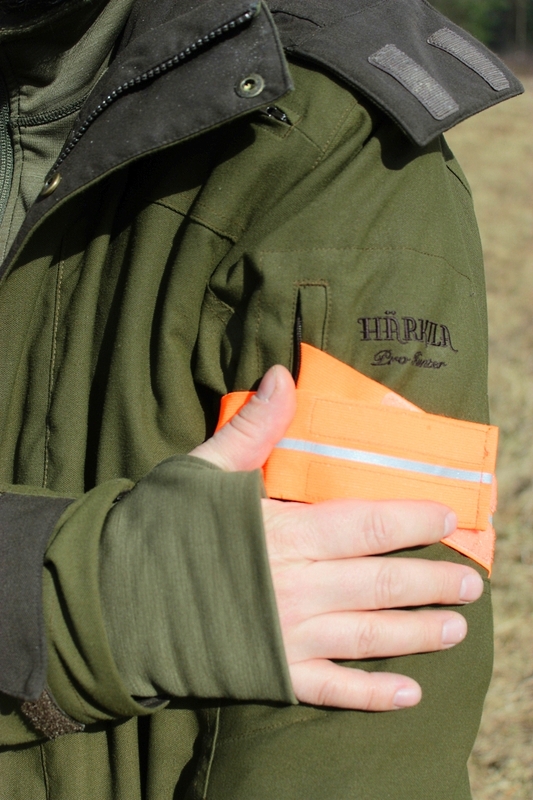 The jacket also has high visibility straps on both sleeves, that along with a high vis hat is a legal requirement on driven hunts in some countries. The quick load strap keeps the pockets open and allows easy access in case of need for quick reload. This is a good feature on a driven or rough shooting day. Large side pockets also have drain holes at the bottom. As this is a Scandinavian product, it also features radio/gps pocket. There is also a zip inner pocket and large game pocket on the back. The zip is strong and being 2-way useful in the high seat. 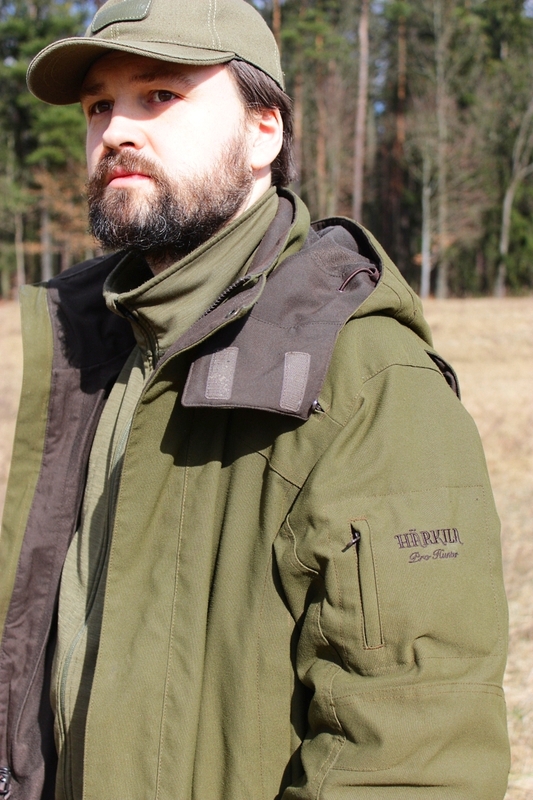 Apart from all the above, in my opinion it is also quite elegant design and unlike camouflage, this jacket can be worn casually not only when hunting. 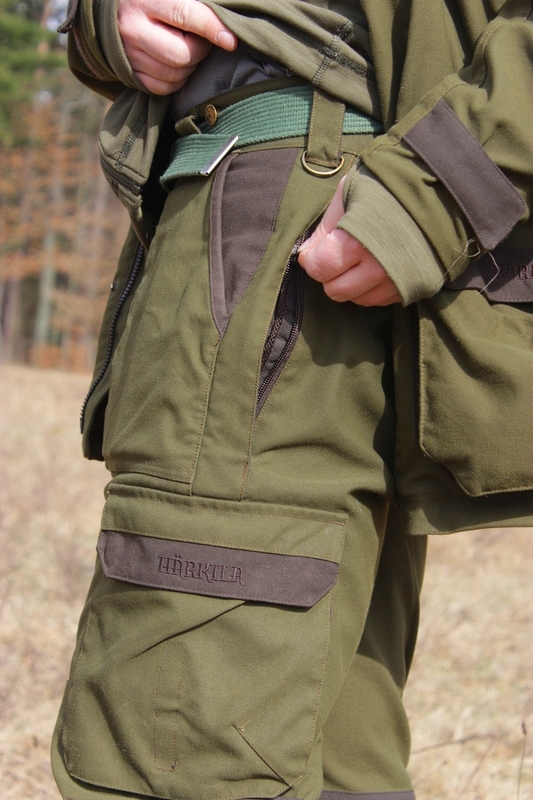 Similarly to the jacket, Harkila Pro Hunter X trousers are comfy and practical. Extremely waterproof and tough, but still breathable. I have not damaged them in two years of use despite climbing fences and going through brambles, branches and so on. The pockets are well designed and deep enough, so I never lost my keys or a phone (this happened before…). The cargo pockets on the thighs are large enough to hold usual kit. The left pocket can be divided in two with Velcro, which allows to keep for instance a knife and torch upright in one pocket without them knocking about and making noise. There is a zipped wallet pocket on the back as well. 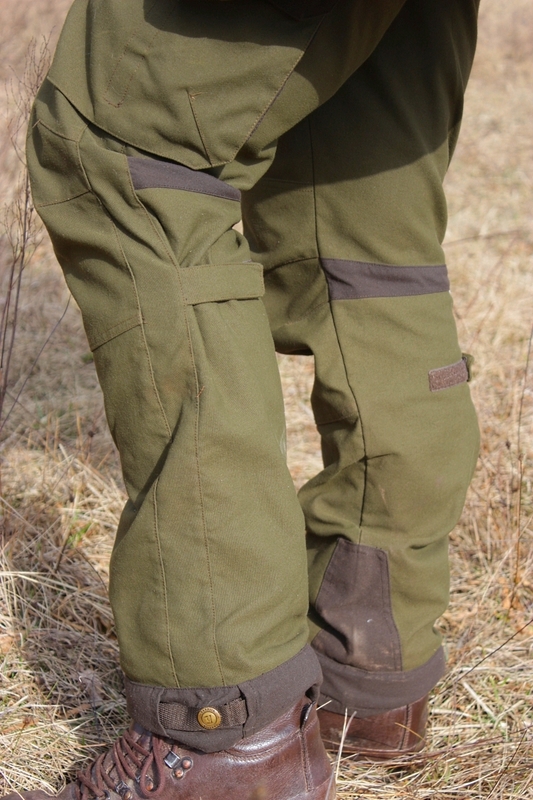 The trousers also have Cordura reinforcements and the “snow lock” – adjustable strap at bottom hem, so it is possible to get away without gaiters. Also back knee adjuster strap helps creating more room at the calf if needed, however I prefer my trousers’ leg to be close to the body. Pro Hunter X trousers also have a rubberised band around the inside of the waist, which works very well and prevents shirt from pulling out. Buttons and zip are good quality, belt loops are nice and wide and there are also stubs for braces available if needed. 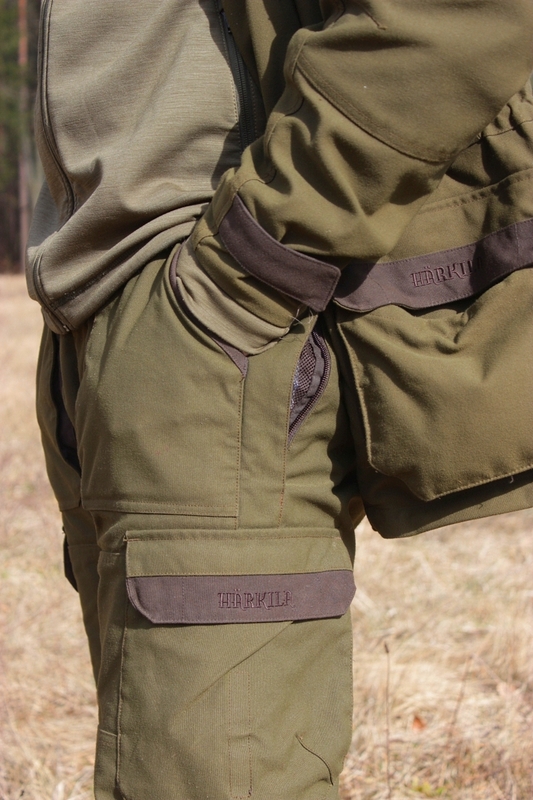 However, the most important feature of the Pro Hunter X trousers for me are the ventilation zips on the back of the thighs. An option of increased ventilation is invaluable while stalking. It is also really appreciated during driven hunts, when a quick march to the peg is often required, followed by staying stationary for longer periods of time. To prevent getting wet and then subsequently cold, it makes sense to undo the ventilation zips during exercise, and zip them back later on to prevent heat loss. In summary, I am very happy with my Harkila Pro Hunter X suit and hope to get a few more years of use out of it. Are there any disadvantages? The fabric is really hard wearing, but unfortunately it is also quite heavy. Especially jacket weights a good bit. Also sizing is on a big side, which is something to remember when ordering online. The biggest “flaw” I guess is the price… However, quality is never cheap. I tried various hunting clothing in the past and never got a pair of trouser that would last longer than a season. Most of the trousers never was waterproof (claimed to be…) or was only for a short period of time. Most of then quickly got ripped on fences, brambles and bushes. When I add the cost of all the gear I bought over the years, I think Harkila still must be cheaper. Also when I see the suit’s condition after two years’ of use, I am confident it is going to last a few years more. Also 5-year warranty gives a piece of mind (I tried that couple of years ago when Harkila replaced my backpack without any questions asked). 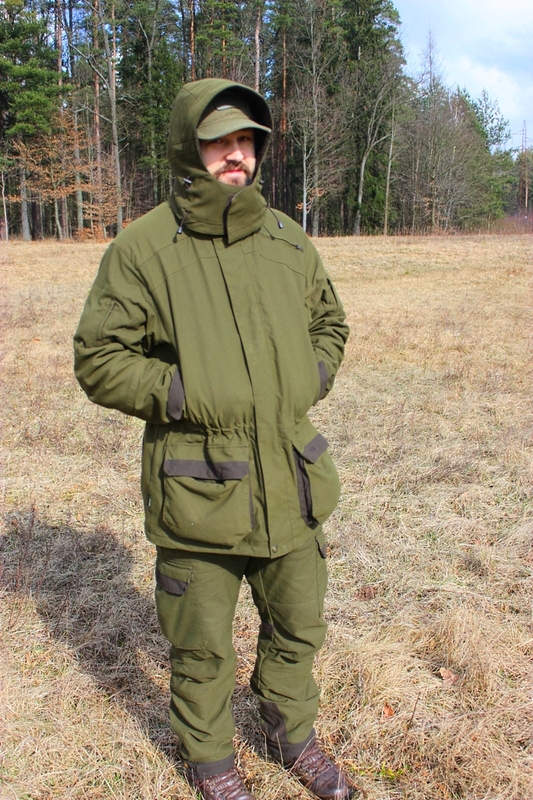 So, if you want to be dry and comfortable, think about Pro Hunter suit. As they say, pay once cry once!